IMHO, for fishing, the best motorization is the electric motor at 24V with a Digital Maximizer. 4) The Wavewalk is stable but once you deploy the electric motor down it becomes rock solid stable. I am having fun on the big lake when I see big boats with V profile having sway (rocking side to side like hell) and my kayak with the trolling motor deployed is stable like a rock (no sway). 5) After trying over 5 trolling motors I did finally settle for 24V with 70Lb thrust. If I have the chance I will go for 100Lb. There are some important advantages of 24V with the Wavewalk. a) You need two batteries that will have the weight nice distributed in the twin hull for balance in the front. d) 24V motor has a heavier coil than 12V (12V has 11Kg, 24V has 15Kg). The center of gravity moves low, than means more stability. A gas motor raises the center of gravity, so it’s not ideal. The only drawback for an electric motor is that it does not have the power of the gas outboard, but with 24V I can cruise for more than 24 hours on penny in comparison with gas cost. Plus the torque is instantaneous. And for trolling with 1.5-2mph there is plenty of thrust. You just need to dial around 15-20% of the throttle. At full throttle the speed is 8Km/h. I did prefer a simple mount for the motor, I just use a 2×4 regular wood from Home Depot. There are many times when I don’t need the motor on the kayak, therefore simplicity is the best. Last performance of my motorized kayak was on 29 August trolling around 15 boats on Lake Ontario 3 km offshore at night chasing salmon. Imagine how much gas those guzzler burn and in top of that with a slick W500 I can dance around those boats that steer like snails. Actually after 10PM there were no boats around just me and another few kayakers in [fins and push-pedal driven kayaks] that were tired of pedaling and were close to shore. A [fins and push-pedal driven] kayaker can’t match the advantages of a W500 electric motorized since pedaling for hours is not easy. Pedal drive is dead in shallow water or swamps with vegetation. I do use the Wavewalk in a rapid stream that has sometime just few inches of fast water. The pedal drive is useless there. The best sprint on water is electric: instant torque at fingers tips. I own two W500 looking to get one W700 to have more fun with the kids. No other craft has such open design. I also got a 2HP Honda outboard for the W, and I will start to use it in Spring. Here is already cold and fishing days are limited now. 70 lbs thrust is very powerful, and I’m sure your electric motor setup lets you go pretty fast, but outboard gas motors have some advantages that are hard to duplicate in electric motors, and range is one of them. 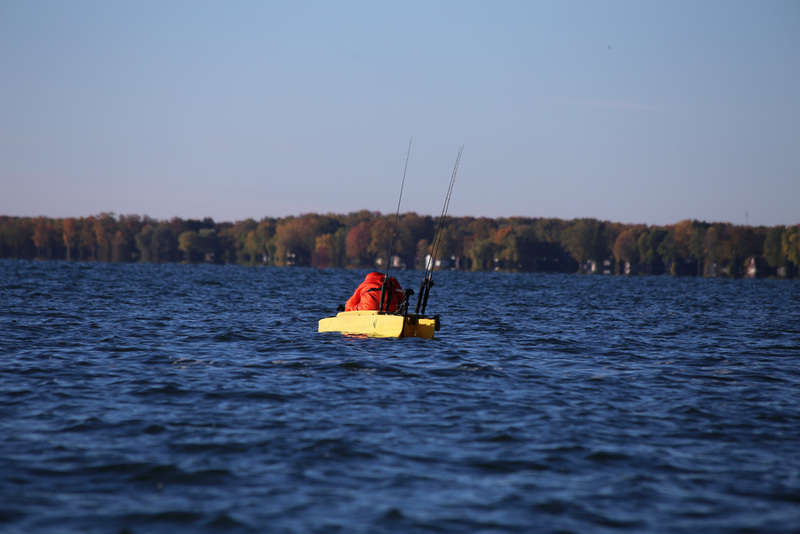 Thank You for sharing your experiences with electric boating in the W500. I have a Minnkota 70 lb. thrust 24v bow mounted elec. trolling mtr. that I use for bowfishing from a 16′ SmokerCraft. Your conclusions are spot on. Some of my most productive fishing trips in this lifetime were with this same motor on a 12′ Sears aluminum skiff. And, most hot near shore fishing grounds are accessible by public landings or some form of land based access. I’m not knocking the small outboards. There’s a place in my Mother Ship for a Honda 2 hp. But, electrons are so quiet, clean, and affordable. There is a saltwater transom motor at 112Lb thrust on 36V. This will be the most powerful electric motor for Wavewalk. Another one is the Torqeedo, but that is very expensive (German product). The best thing about Wavewalk is that the design is open for paddling, electric and gas motorisation. Excellent smart design/craft. Torqeedo Travel is another beast that can be fantastic for W.
Unfortunately not cheap, but maybe in time will be cheap. I have no doubt a 112 lbs thrust electric motor would fit both the W500 and W700, but I’d be a little concerned about travel range / time, since 112 lbs is more than 3 times the typical thrust in motors used to power fishing kayaks. Indeed, they look like good motors (maybe a little over hyped, though 😉 … ), and they shouldn’t be that expensive due to the favorable exchange rate that European exporters benefit from (and US manufacturers suffer greatly from…), but I think that if you use off-the-shelf marine Lithium-Ion batteries in combination with a common, inexpensive electric motor, you could get more bang for you buck. I have been playing with the 70Lb thrust for 2 years now. I am very confident that W500 will be fine with a 112Lb thrust motor. 2Hp gas is a lot more powerful than 112Lb electric thrust. It is very difficult with electric to get 1Hp. Please read below raw details about Lb thrust vs gas Hp. For a 12 V system 1 HP equals to 60 A, which is close to normal 1 lbs/A of thurst. A normal trolling motor max draw is 4-6Amps therefore below 100W, way below 1Hp(735W). These guys from Minnkota amaze me all the time they have a 160Lb thrust electric system. Maybe if I get a good deal I will try it. Your comment clarifies things very well. 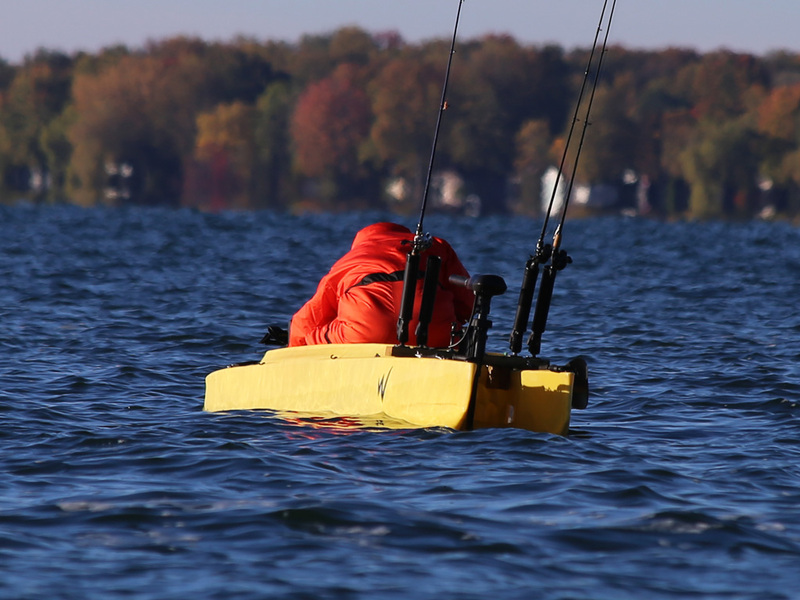 In sum, the faster you want to go, the more efficient the gas outboard is in terms of power output by its weight. For slow-motion (pun…) get a lightweight electric motor, but if you’re into speed (Kenny One-Shot’s W500 real-world speed record is 13 mp, or 11 knots) the way to go is an outboard gas engine. Looks like a great motor! But it’s over a thousand bucks. For less than this price you can get a 2016 Tohatsu 3.5 hp gas outboard with a 20″ shaft. It would work with your W500 (if you drive carefully), and it would be perfect for a W700.